Following almost 3 months of construction work the new section of the Malaga Coastal Path (Senda Litorial de Malaga) is now complete in front of Macdonald Doña Lola Resort. Guests can now enjoy a seamless link between the resort and everywhere west of Calahonda including Macdonald Leila Playa Resort and onwards towards Marbella. 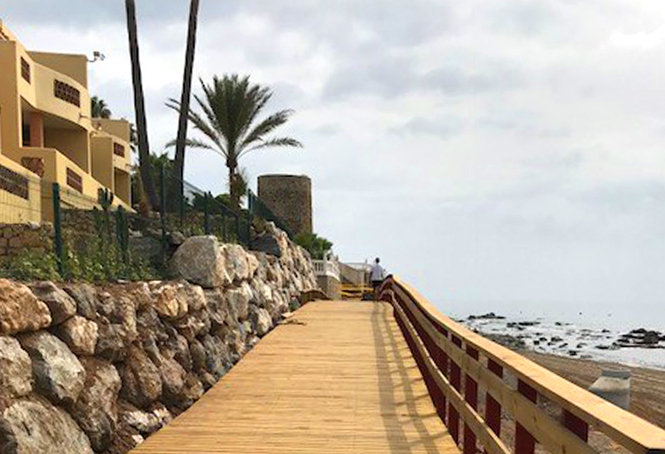 Work continues on the boardwalk to the east of the resort which will soon connect Calahonda to neighbouring beaches and towns including Fuengirola and Torremolinos. A staggering 180km in length the attractive wooden boardwalk runs parallel to the sea offering walkers, joggers, cyclists and families safe passage along the coast with easy access and magnificent views over the sea and numerous beaches. To find out more and see the boardwalk for yourself watch a short film here or visit the information page on Andalucia.com.